854 pages | 25 Color Illus. | 271 B/W Illus. "This book is written … in a very lucid manner. The language used to express the author’s viewpoint about the subject matter is very interesting and attracts the reader to jump deeper into the book. It not only covers the elementary portion of thermal sciences, but the author also skillfully elaborates on the important topics. In total, the book is extremely useful for the beginner and the skilled practitioner in the field of thermal sciences." This book is one of the most integrative works I have ever seen in this field. It mixes important theoretical subjects and real world problem solutions. The presentation is done in a simple and efficient way. I recommend this book for faculty, undergraduate/graduate students, engineers and scientists." 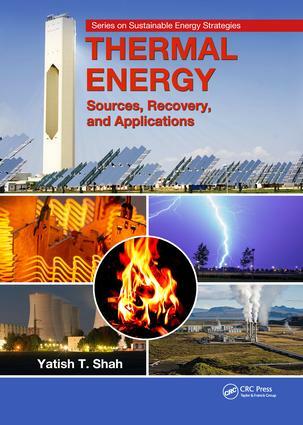 "A comprehensive, almost encyclopedic treatise of thermal energy technologies and their applications. The level of detail on individual tecnhologies is extraordinary and the reference listings for each chapter covered are without equal . Thermal Energy should be a required reference for those who want to be informed on this important subject." Basics of Thermal Energy. Combustion. Fusion. Fission. Geothermal. Microwave. Plasma. Waste Heat. Thermal Energy Storage. Novel Processes, Devices and Materials for Thermal Energy Transfer and Transformation. Yatish T. Shah received his B.Sc in chemical engineering from the University of Michigan, Ann Arbor, USA, and MS and Sc.D in chemical engineering from the Massachusetts Institute of Technology, Cambridge, USA. He has more than 40 years of academic and industrial experience in energy-related areas. He was chairman of the Department of Chemical and Petroleum Engineering at the University of Pittsburgh, Pennsylvania, USA; dean of the College of Engineering at the University of Tulsa, Oklahoma, USA, and Drexel University, Philadelphia, Pennsylvania, USA; chief research officer at Clemson University, South Carolina, USA; and provost at Missouri University of Science and Technology, Rolla, USA, the University of Central Missouri, Warrensburg, USA, and Norfolk State University, Virginia, USA. He was also a visiting scholar at University of Cambridge, UK, and a visiting professor at the University of California, Berkley, USA, and Institut für Technische Chemie I der Universität Erlangen, Nürnberg, Germany. Currently, he is a professor of engineering and co-director of the Hodge Institute of Entrepreneurship at Norfolk State University. Dr. Shah has written five books related to energy. He has also published more than 250 refereed reviews, book chapters, and research technical publications in the areas of energy, environment, and reaction engineering. He is an active consultant to numerous industries and government organizations in the energy areas. Sustainable energy strategies must consider five parameters: a) availability of raw materials and accessibility of product market, b) safety and environment protection associated with the energy system, c) technical viability of the energy system at the commercial scale, d) affordable economics, and e) market potential of the given energy option in a changing global environment. The Sustainable Energy Strategies book series focuses on novel ideas that allow different energy sources to be sustainable for the long term within the framework of the five parameters outlined above. Strategies may include both improvement in existing technologies and the development of new technologies.